Haji Imdaullah Muhajir makki (RehmatullahAliah) spritual guide of all Deobandi ‘akabir” STANDING in Mawlid Gathering and doing “NIYAZ of Mawlana Rum (RehmatullahAliah)! Also Shaykh Abdul Haq Muhaddith Dehalvee (RehamtullahAliah) stands for MAWLID . “Ya Allah , none of my deed ( ‘amal) is worth being presented in your Honour. All my deeds have some defect and my desire ( niyat ) is involved in it. But one of my action/ deed is very good and honourable and that is , during the GATHERINGS OF MAWLID ( mehfil e milad) I STAND AND SEND BLESSINGS (SALAM ) AND WITH WITH UTMOST HUMILITY AND LOVE I SEND PEACE AND BLESSINGS UPON YOUR BELOVED SAL ALLAHU ALAYHI WA SALLAM . At this point I would also like to remind that Mawlana Ismaeel Dehalvee , the founder of deobandism said that traveling to visit grave and standing in honour of some one except Allah is shirk . ( Taqwiyatul Iman , page 10 , page 33). 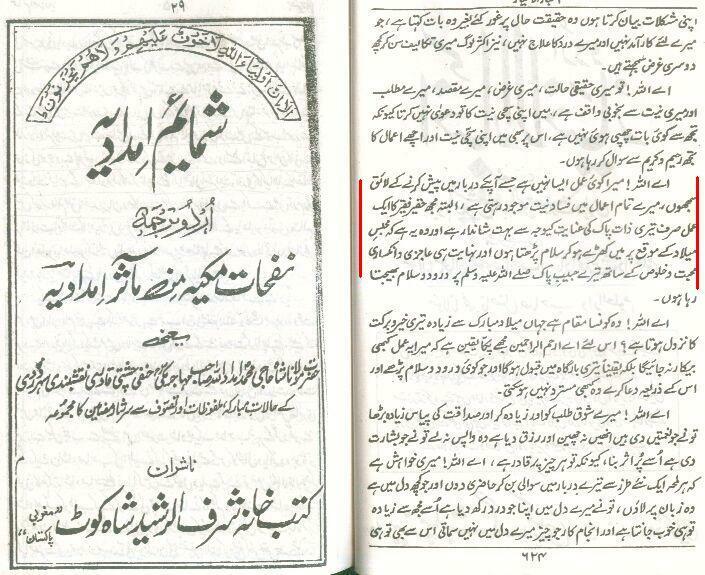 Mawlana Rashid Gangohee said that this book “ taqwiyatul imaan” is the core of Islam. 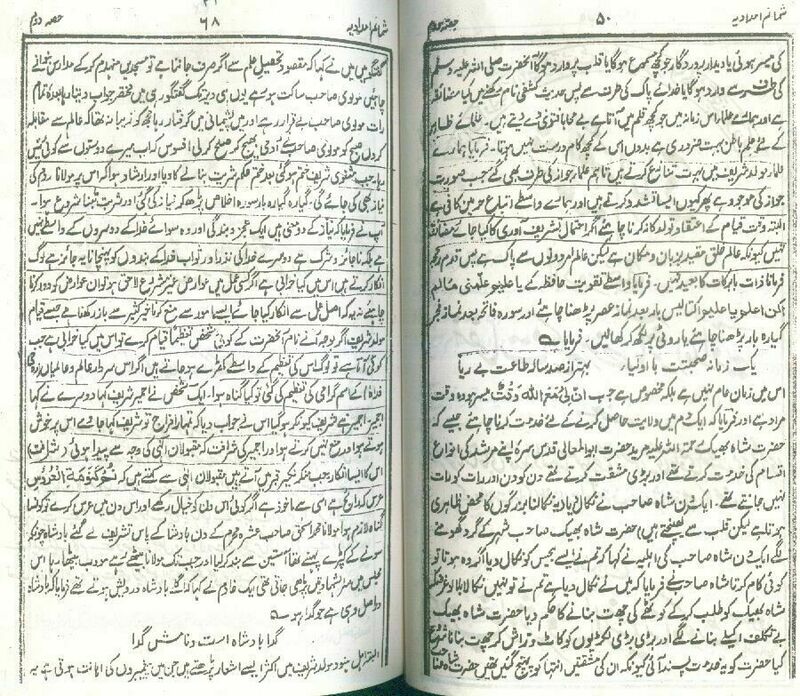 The sufi tariqah of Deobandis pass through Haji Imdadullah makki (rh) . All the top deobandi ‘akabirs” like Mawlana Rashd Gangohee , Mawlana Thavee etc were disciples of Haji Imdadullah makki(rh). Mawlana Ismaeel dehalvee was a disciple( mureed) of sayeed Barewlwi , whose holy act of destroying muslim grave has been mentioned earlier. As per Mawlan Ismaeel dehalvee the soul (ruh) of Sayeedina Abdul Qadir gilani (rd) and the soul of Khawja Bahuddin Naqshband (rd) fought for 1 month over the issue as to who want to have pride in giving teachigs to sayeed barelwi. Haji Imaddullah makki (rh) is here doing ” khatm ” of Mathanvi of Imam Jalaluddin rumi (rh) and deobandis have objection on doing “quran khawni’! ” why doothers object when people stand during mawlid when the name of prophet ( sal allahu alaihi wa sallam ) is mentioned? People stand in respect when they have a visitor , so what is the problem when people stand after hearing the name of prophet ( sal allahu alaihi wa sallam) during mawlid?